Huí Guō Ròu (回锅肉) literally means "meat returned to pot". 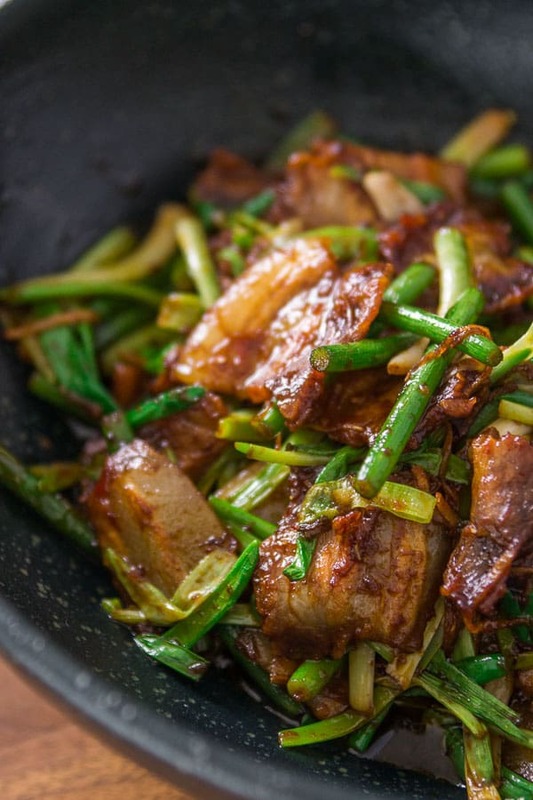 The pork belly is boiled once to tenderize and then stir-fried with garlic scapes, tianmianjiang and doubanjiang. Huí Guō Ròu (回锅肉), which literally means “meat returned to pot” is a dish with Sichuan roots. As the name implies, the meat is boiled once before being stir-fried. 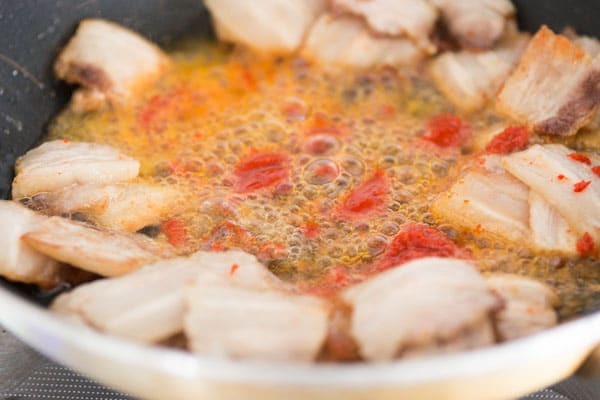 The idea is that by boiling the pork belly, it not only renders out some of the fat, it also tenderizes the meat. Because the boiling time is so short it’s debatable how tender it makes the meat, but what it does do is prime the fat for high-heat cooking. 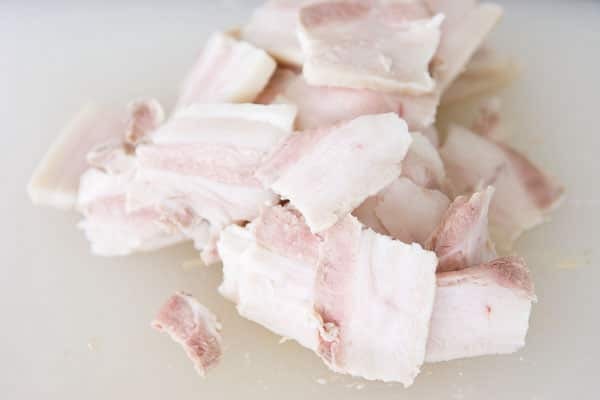 After being boiled and sliced, the pork belly is stir-fried over high-heat, crisping up the edges, while rendering the fat in the middle melt-in-your-mouth tender. It’s seasoned with Doubanjiang, a fiery chili broad bean paste, and a sweet and nutty wheat and fermented soybean paste called Tianmianjiang. Added to the hot pan, the sauce instantly caramelizes, glazing each slice of pork with the perfect balance between sweet and spicy, with a lingering savory complexity. While many versions of this dish call for adding other vegetables such as cabbage, bean sprouts or peppers, I like it simpler. Garlic scapes and scallions are the only vegetables I add, contributing aromatic allium notes while giving the pork center stage. Put the pork belly in a pot that it barely fits in. Add cold water until the pork is completely submerged. Remove the pork, then bring the pot of water to a boil. Add the pork, cover and simmer over medium low heat for 20 minutes. Remove the pork from the liquid, wrap it in foil and then place it in the refrigerator for 3-4 hours. This solidify's the fat making it easy to slice. You can skim the liquid and use it as a soup base for another dish, or just pour it out. 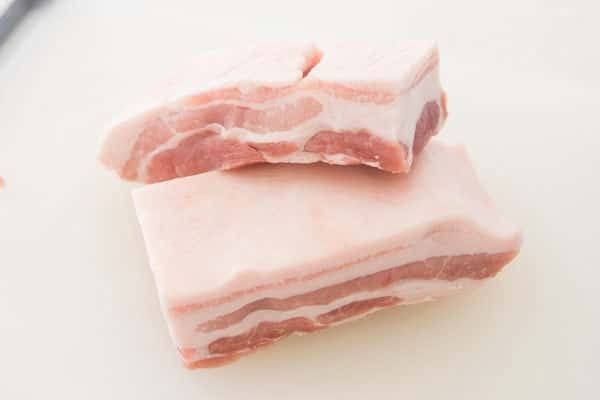 Once the pork is chilled use a sharp knife to slice it into 1/8" (3mm) thick slices. In a small bowl, combine the Tianmianjiang, Shaoxing, soy sauce and sugar. Heat a wok or large sauté pan over high heat until very hot. Add the oil, then add the sliced pork belly. Stir-fry until the pork has started to crisp around the edges. Drain off the excess oil and then push the pork to the edges of the pan. Add the ginger and doubanjiang. Fry until the chili sauce is fragrant (10-15 seconds). Add the garlic sprouts and stir-fry with the pork until the garlic sprouts are cooked through. Add the bowl of sauce along with the scallions and stir-fry until all the liquid has evaporated. …and if I can’t find ‘garlic scapes’ (which I doubt I will), what do I use? regular garlic cloves? Hi Mel, you can substitute with more scallions and add a few cloves of chopped garlic in with the ginger. I am looking forward to making Twice Cooked Pork for dinner tonight! That will be our dinner too.. Tried this recipe last week and it was really good! I’m going to make it again but I’m wondering what else I can use the sweet bean paste for. Hi Roland, tianmianjiang is great in marinades for meats and can go both western or eastern. For instance you can use it as a component of a western BBQ sauce, but it works equally well in stir-fries and marinades. Is the skin on or off of the pork belly? Can’t tell from the pictures. Cooked this tonight and overlooked the meat. Will have to give it another shot in my wok. Hi Paul, it’s skin off. The relatively short boiling time isn’t enough to tenderize the skin. As for over cooking, this goes very fast, so it’s important to literally have all the ingredients lined up next to the pan so you can throw one in after the other. You can also try slicing the pork a bit thicker next time. EVERYTHING. Also, add sichuan peppercorns for extra awesome. I’m wondering if substitutions are alright? I already have gochujang and doenjjang, which sound similar to the Chinese condiments. I also do not have shaoxing wine, and wonder if any other kind of cooking wines are similar, or if I should invest. I have aji-mirin, sake, and the American red, white, and sherry. I don’t usually cook Chinese food, so I do not have the ingredients on-hand. Hi Red, gochujang is not at all like doubanjiang (other than both being spicy), and doenjang is not like tianmianjang at all. If you have hoisin sauce you can substitute it for tianmianjang. Otherwise you could make this with gochujang and doubanjang keeping in mind that you’re dish is probably going to taste quite different (not necessarily in a bad way) and you’ll need to adjust the amounts as they differ in salinity. As for the shoaxing the closest would be a dry sherry, and sake would be a far away second place. I hope that helps.